Can you give us a rundown on the farm's history? ​Mum and Dad were from Balaklava SA, they were looking to expand and came to look at the Wyalkatchem area in 1968. They purchased ‘Baladeen’ and moved over in 1969. I came back from Uni in 1992 and still live on the home farm with my wife and two boys aged 8 and 9. We started out with clover pastures and ran sheep with cropping, but now 100% cropping. Our country is very sandy and we have issues with erosion so are moving to CTF and using deep ripping. Being a sandy farm, potassium and nitrogen are the big factors so we need to retain the stubble where we can. What HWSC methods have you used previously? 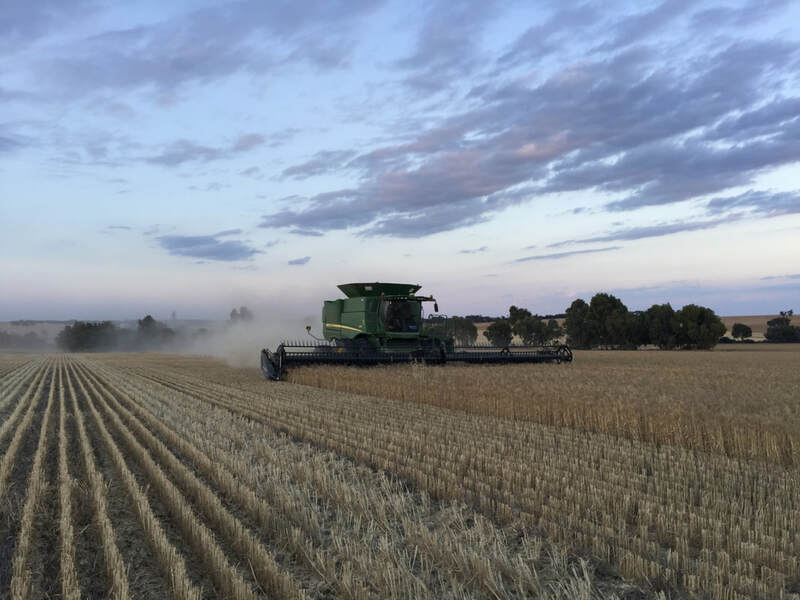 ​We did chaff carts back in the 2000's for about 5 years, and then windrow burning after that, we were considering going back to chaff carts but were given the opportunity to join the 2017 Farmer Research Partner Group with Seed Terminator. 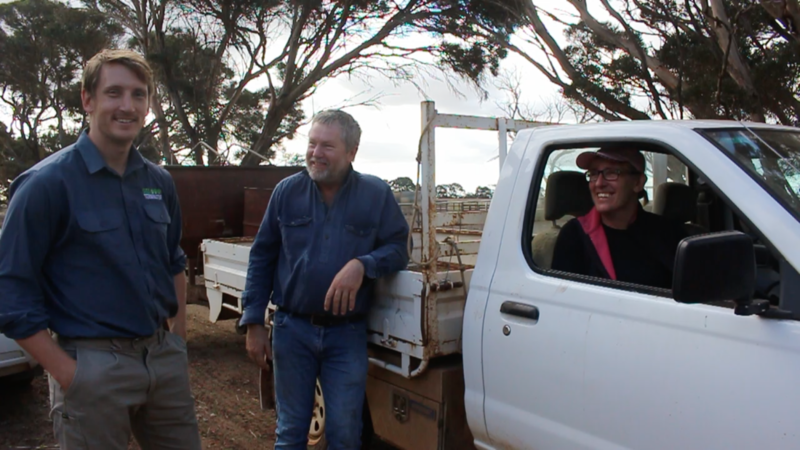 There was lots of talk in WA in 2017 after their 2016 run; we discussed it with our consultants who had ties with Chris Robinson from Kojonup Farmanco and made contact with Andrew Todd who is one of the 2016 pioneers and then put in an application online. How did MY17 and MY18 compare? ​2017 was our first year with the Seed Terminator, we had it on our Case 7230 and it was pretty much running at 100% engine load all the time. We changed over to a new Case 7240 halfway through the 2018 harvest and the new machine did about 100 hours with the Seed Terminator. The 7230 needed replacing, it wasn’t a decision based purely around the Seed Terminator but for CTF reasons as well. I definitely noticed the reduction in power on the old header, and with the new header, I didn’t even notice it was on the back. The power draw is down and even after 350 hours cutting at around beer can height or lower the screens are still good to go. The new header with MY18 version was running at 80-90% engine load and even pushing into some really good crop, going uphill, in deep ripped country with huge straw loads it was no worries at all. Any particular challenges this season? 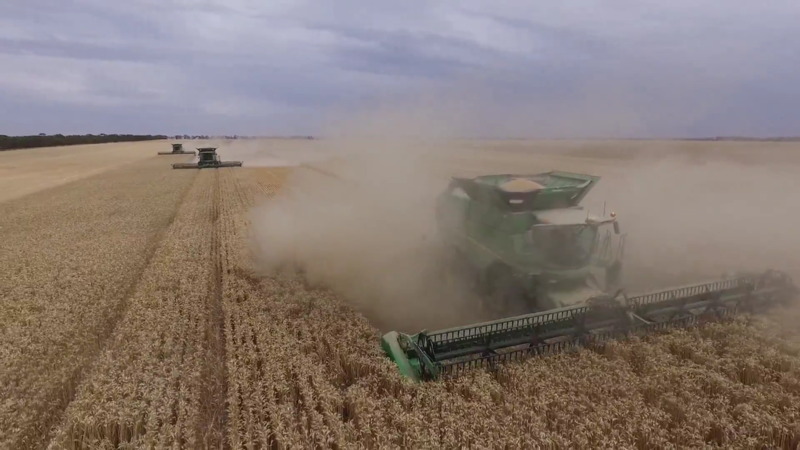 ​I was worried about a new machine going into harvest and worried about wear and extra engine load, (the main issues we had in 2017), but Nick has certainly sorted those things out. We had more straw going through the machine, but no real challenges, it came off beautifully. It was a good season for us this year, best tonnage we've ever had, I certainly can't complain. 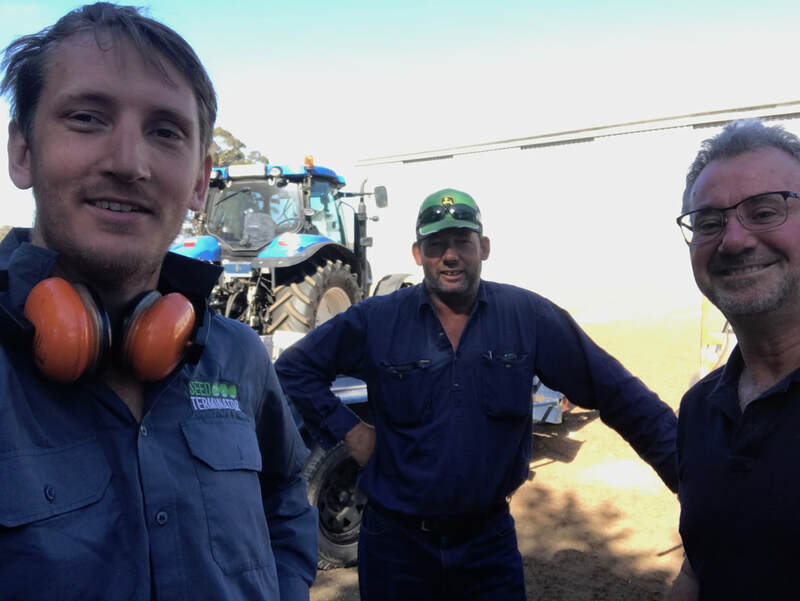 ​The biggest plus has been being about to do other operations in February and March; liming and ripping are two big jobs that you can concentrate on rather than splitting time between those and burning as well. It's hard to work out exactly, but it saves our operation a good couple of weeks; two people, two utes, we’d concentrate mainly on wheat stubbles, but occasional canola and barley as well. Burning seemed to drag on for weeks and weeks, its a lot of hours and a few thousand dollars, maybe $5000, but burning into the evenings, doing odd hours, it's just a stressful job. 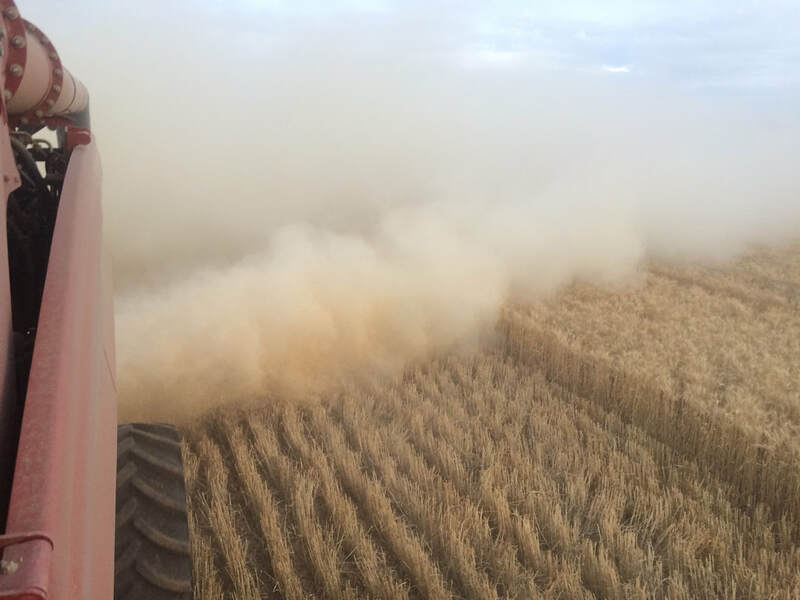 Chaff carts were worse as they'd burn for 3-4 days and cause escape fires and were overall more stressful than windrow burning. We cleaned things up pretty well in 5 years and then thought it was a good time to get out of it. Have you tested for Herbicide Resistance on your property? Our herbicide resistance test hasn't come back yet, we did our first one at harvest time this year. There was quite a bit of ryegrass this year as everything went into dry and then everything came up at the same time with the rain. We’ve definitely noticed were having to use bigger and bigger rates of chemicals to keep on top of ryegrass. The Seed Terminator is just another tool for weed management, I hope we see a reduction in the seed bank over the next three years. I’m off a family farm in South West Victoria; it’s a mixed farming enterprise comprising of cropping (mixed cereal and pulses), fine wool and prime lambs. I undertook my undergraduate degree at the University of Tasmania in Hobart on a full scholarship, it was a fantastic opportunity to be exposure to such diverse agricultural production; and during my honours year I investigated the impact of herbicide residues in poppies. My passion for research into herbicide resistance continued to grow and after finishing university I started a job with SARDI working in cereal, pulse and canola herbicide tolerance. I am currently undertaking a PhD and my research is aimed at providing a better understanding of resistance development in L. rigidum to pre-emergent herbicides in the Group J (thiocarbamates) family. This also includes management strategies for grower implementation. I was fortunate to make the discovery and publish a scientific paper ‘Resistance to multiple PRE herbicides in a field-evolved rigid ryegrass (Lolium rigidum) population’. 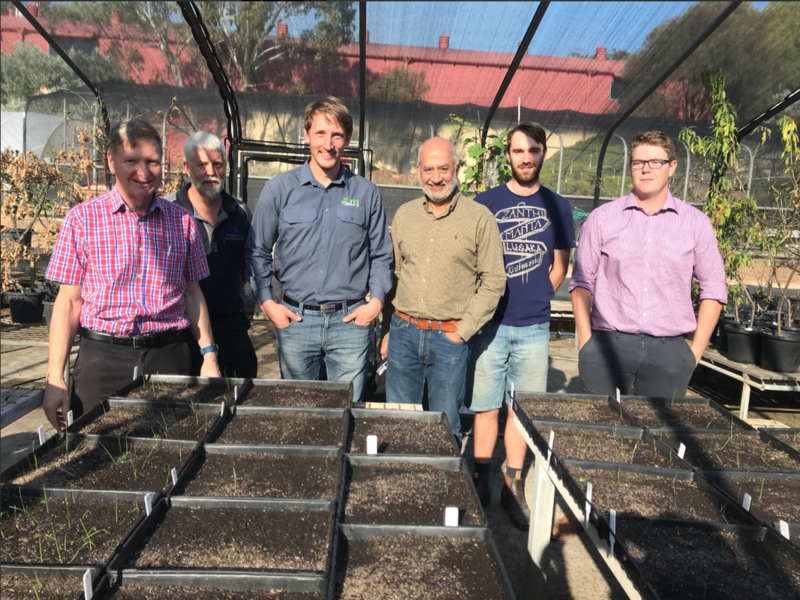 Being supervised by three highly respected experts in this field Chris Preston, Gerjeet Gill and Peter Boutsalis at the University of Adelaide’s Weed Science Research Group, has been an incredible experience and privilege. In laymen's terms, what did your research find? A population of ryegrass from a paddock on the Eyre Peninsula, South Australia is confirmed resistant to all of the pre-emergent herbicides, Avadex, Arcade, Trifluralin, Propyzamide, Sakura, EPTC and Thiobencarb. This study documented the first case of field-evolved resistance to thiocarbamate herbicides in ryegrass. ​In non laymen's terms: A population of rigid ryegrass (Lolium rigidum Gaudin) from a field on the Eyre Peninsula, South Australia, was suspected of resistance to thiocarbamate herbicides. Dose–response studies were conducted on this population (EP162) and two susceptible populations (SLR4 and VLR1). The resistant population exhibited cross-resistance to triallate, prosulfocarb, EPTC, and thiobencarb with higher LD50 to triallate (14.9-fold), prosulfocarb (9.4-fold), EPTC (9.7-fold), and thiobencarb (13.6-fold) compared with the susceptible populations SLR4 and VLR1. The resistant population also displayed resistance to trifluralin, pyroxasulfone, and propyzamide. The LD50 of the resistant population was higher for trifluralin (13.8-fold), pyroxasulfone (8.1-fold), and propyzamide (2.7-fold) compared with the susceptible populations. This study documents the first case of field-evolved resistance to thiocarbamate herbicides in L. rigidum. What is the problem with the herbicides, why are weeds becoming resistant so quickly? What is driving the rise in Herbicide Resistance we’re seeing? What does your research mean for Australian Farmers in practical terms? Herbicide resistance is a major threat to cropping systems worldwide. Many herbicides previously used for weed control, have failed or are failing to provide adequate control of major grass and broadleaf weeds. Annual ryegrass is one of these problematic weed species, which has developed resistance to a number of pre and post-emergent herbicides, across multiple herbicide groups (modes of action). The current story of herbicide rotation has clearly been demonstrated as a non-sustainable long-term tactic. Incorporating non-herbicidal methods of weed control in combination with strategic herbicide use is fundamentally the way forward. HWSC: every paddock every year. 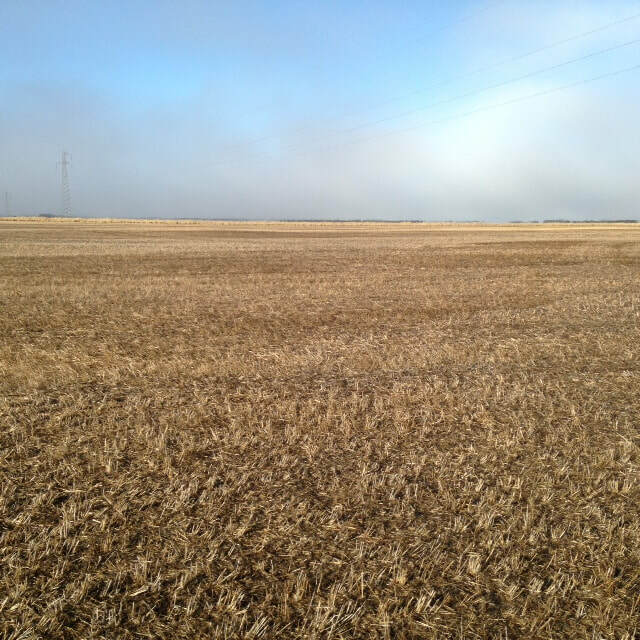 All crop types (pulses, canola and cereals) provide an effective opportunity to implement harvest weed seed control (HWSC) tactics. However each situation needs to be carefully thought out and changes to harvest method may need to be considered. Back home, we found narrow windrow burning to be a very effective strategy to manage ryegrass in lupins. It allowed us the chance to capture seed from late germinating individuals and put these into a narrow chaff line which would later be burnt. Previously this ryegrass seed would have been spread back onto the paddock. On our farm we have demonstrated that the implementation of HWSC when used in combined with herbicides has allowed us to better manage problematic weeds such as ryegrass and reduce the weed seed bank. Impact Mill Technology: A capital investment in weed control equipment is big, but what equipment isn’t? Investment in mechanical weed control methods in combination with herbicides will have a longer term impact than herbicides alone. A combination of these practices over multiple years will reduce the amount of viable seed returning to the seed bank. A mature ryegrass plant can produce many thousands of seeds and combined with seed longevity of 1-4 years (depending on conditions) requires several years of management to reduce the seed bank. Think of what you will do in 5-10 years if we continue to rely on herbicides alone and are no longer able to control problematic weeds using herbicides due to resistance. For your available herbicide modes of action, it puts emphasis on Canola and pulse crops where you still have available chemistry. Can you explain the testing process you are doing for Seed Terminator at Weed Science Research Group of the University of Adelaide? It is really exciting to be working with Nick Berry as at the end of the day mechanically killing weed seeds is fundamentally important to incorporating non-herbicidal forms of weed control into our current farming systems. The Weed Science Research Group has been testing new mill outputs allowing for rapid and concise dissemination of outcomes. We take the test samples provided, spread them on to trays in a growing medium, after four weeks an emerging weed count is performed and these results are documented and provided to Seed Terminator. These outcomes have allowed for further development and overall improvement of this technology. This technology is easily adapted to commonly used harvesters in existing farming systems, I'm excited to be a part of solutions coming out of this research. 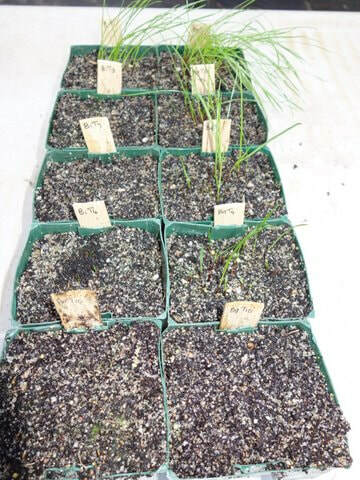 "Different responses of 2 ryegrass biotypes to pre-emergent herbicide treatment. Top to bottom: Untreated, Avadex Xtra®, Arcade®, Boxer Gold® and Sakura®."